Anyone get any advice as to how to troubleshoot this one? All seems to be working ok apart from the inverted peak the wave forms. the discharge time is to long - and because of that you have the peaks in the tri and sine wave. Thanks very much for that, will have a poke around next week and see what I can find. I'm having the same imperfection in all 3 VCOs I Made, have you figured it out yet? Dunno where to find the schematic, but whatever is supposed to discharge the integration capacitor has too much resistance. This will also cause CV tracking to be worse as the frequency increases. This can easily be caused by error in picking resistors, such as using a 100K instead of a 10K somewhere (that value is just an example, not actual). It could also be caused by a poor solder connection. Any luck with this one? 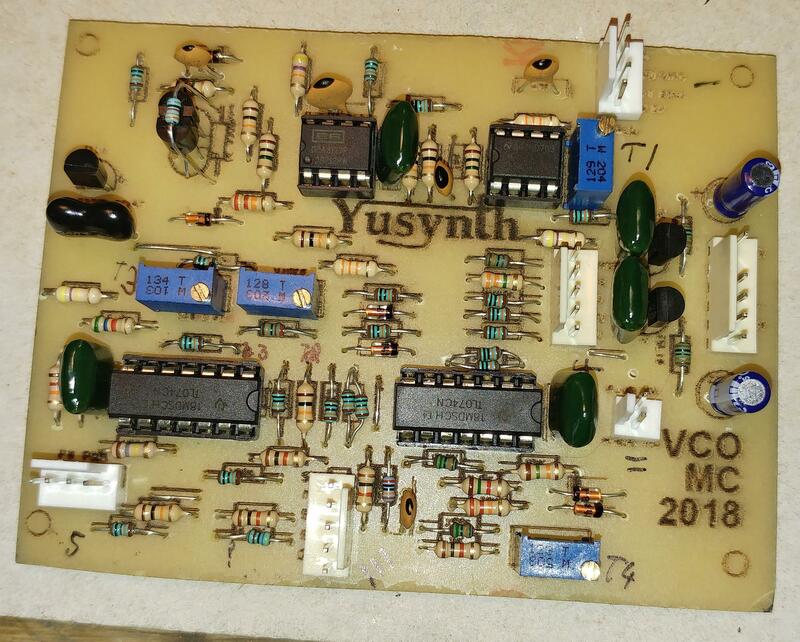 Recently got some free time again so want to try to get this VCO fixed. If have checked all the parts again and everything seems correct. Not tried re-soldering that area so will give that a go. After poking around a bit I noticed this on pin 6 of U7 (yellow). Earlier in the circuit around R22, there is a massive spike, but at this point I am pushing my abilities a bit as to how to investigate further. In the VCO schematic, the discharge is implemented by FET Q1. It's resistance when "on" is too high to discharge C1 quickly enough. There are a few ways to deal with this. One is to supply a gate voltage (at discharge time) that opens Q1 more. Someone with the circuit and scope might be able to help there. Another way is to reduce the size of C1. If C1 is half it's current size, it will discharge twice as fast. However, that will cause the VCO to oscillate an octave higher. That might be mitigated by changing the CV input circuit, but I'm no help there - I'm sure it can be done, but I just don't know how. Another thing is that there is no such thing as a sawtooth VCO that can reset the integration cap instantly. All one can do is try to make the reset time as short as possible. That said, there is no way to completely eliminate the glitch in the triangle output. What I have read from modular users and designers is that it if you start with a Triangle core and then use a waveshaper to create sawtooth from the triangle, you will have a perfect triangle and sawtooth with no glitches. I've played with using a saw passed through a waveshaper to make tri and the temptation is to attempt to filter the glitch out. The problem with that is that the filter will do more than remove the glitch - it will also cause the ramps of the triangle wave to become S shaped curves (also called splines). And depending on the filter, it can also cause the triangle output amplitude to drop as it's frequency is increased. Even filtered, the glitch is still there unless the filtering is so heavy that the output becomes a sine. may u are also willing to post a pic? Thank you for the explanation JovianPyx, it is interesting and helpful to know these things. I can confirm C11 and C10 are marked '47' and '10' for sure. Here is a shot of the spike which was taken from between R22 and D1. Measured about 17.5 V at its highest. Here is the board. Please forgive the rather poor workmanship! R32 & R49 are matched 100k pairs to make up a 50k as I couldn't get hold of any. Was being caused by U6 TL074. I got given a load of them and tried various ones but they all had pretty much the same problem. Some better than others but still giving what you see in the scope shots. I needed to make an order up to £20 so chucked in a couple of Tl074s and boom, works perfectly now. There is still a very tiny spike and I can just hear it on the sine wave but I guess that as discussed, that is to be expected? Spike on sine or triangle is a part of design of this VCO. Treat as as a VCO's "flavor". How large are these spikes depends on design and speed of used semiconductors (as you experienced yourself). Almost four decades ago I've designed and made ramp VCO (but with 3046-based thermal oven compensation) and it also had spikes on the sine and triangle made from saw. But they were rather small. And if C8 is really 220pF, I don't recommend to lower it's value - it is small enough.